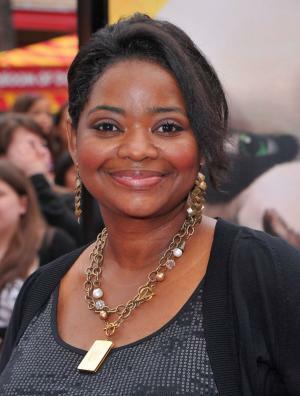 Octavia Spencer was born on the 25th May 1970, in Montgomery, Alabama USA, and is an actress, well known for appearing in such films as “Coach Carter” (2005), “The Help” (2011) and “The Divergent Series: Insurgent” (2015). Currently, she stars in the sitcom “Mom” (2013 – present). Spencer is the winner of an Academy Award, a Golden Globe Award, a BAFTA and Guild Actors Award, all won in the category of the Best Supporting actress. Octavia has been active in the entertainment industry since 1996. How much is the net worth of Octavia Spencer? It has been estimated by authoritative sources that the overall size of her wealth is as much as $12 million, as of the data presented in the middle of 2016. Her salary is $75,000 per episode of the current television series “Mom” (2013 – present). To begin with, she was raised in Montgomery, with six siblings. Spencer matriculated from Jefferson Davis High School in 1988, and afterwards studied at Auburn Montgomery majoring in theatre (1988-1989), and graduating with a BA degree in Liberal Arts. Talking about her professional career, Spencer appeared as an intern in “September of The Long Walk Home” (1986), a movie starring Whoopi Goldberg, then as a nurse in Joel Schumacher’s “A Time to Kill” (1996), based on the book by John Grisham. Other film credits include “Never Been Kissed” (1999), “Big Momma’s House” (2000), “Bad Santa” (2003), “Coach Carter” (2005) among others. She made a number of appearances in television series, including “Malcolm in the Middle” (2000) “The Minor Accomplishments of Jackie Woodman” (2006), however, she attracted the attention of critics landing the lead roles as Serenity Johnson in “Halfway Home” (2007), and Constance Grady in “Ugly Betty” (2007). In 2008, she starred alongside Allison Janney in the highly praised short film entitled “Tate Taylor’s”. In 2008, a brief appearance in “Seven Pounds” as Kate, the nurse, earned her many accolades, so much so that in 2009, Entertainment Weekly published a list of the 25 funniest Hollywood actresses, and Spencer was in the list. In 2009, she appeared in “Halloween II” and “Love at First Time”, then later that year, Spencer’s short film “The Captain” was honoured by CICFF as a finalist for the REEL Poetry Prize. All these projects added to her net worth. In 2010, Spencer joined Viola Davis, Emma Stone and Bryce Dallas Howard in the production of “The Help”, in which she played the feisty and unflappable domestic Minny Jackson, directed by Tate Taylor and produced by Brunson Green, Chris Columbus, Michael Barnathan and Mark Radcliffe, a role which earned Spencer critical acclaim, amid rumours indicating that the actress would receive multiple nominations, and eventually she won thirteen awards in the category of the Best Supporting actress including the prestigious Golden Globe Award, NAACP, BAFTA and the Academy Award. Spencer was so thrilled when she won the Oscar that she could barely speak as she was moved to tears and received a standing ovation. This did her net worth no harm at all! In 2012, Spencer was invited to join the Academy of Motion Picture Arts and Sciences. In 2013, she appeared alongside Michael B. Jordan in “Fruitvale Station”, a film that chronicles the last day of Oscar Grant, who was killed by police at a Bay Area Rapid Transit station in 2009. For the role of Wanda she won National Board of Review Award for the Best Supporting Actress. Recently, she appeared in the films “Black or White” (2015) winning African-American Film Critics Association Award for the Best Supporting Actress, “The Divergent Series: Insurgent” (2015), “The Divergent Series: Allegiant” (2016) and “The Free World” (2016). In addition to this, she landed the main role in the series “Red Band Society” (2015) and recurring role in “Mom” (2013 – present). Currently, she is working on the set of upcoming films “The Shack”, “Gifted” and “Hidden Figures” which are going to be released soon. Finally, in the personal life of the actress, she is still single, says that she would settle for one healthy child, and dates regularly but so far not seriously. Place Of Birth Montgomery, Alabama, U.S.
1 Meeting Oprah Winfrey, I cried like a baby. Meeting Steven Spielberg, I cried like a baby. Meeting Denzel Washington, I gushed like a crazy woman. 3 [on her role as an alcoholic teacher in 'Smashed'] The subject matter is so relevant.People have been having issues with substance abuse since the dawn of time, I imagine, since they started fermenting fruit and vegetables, for God's sake. It was definitely an enlightening part to play. I'll say that I don't think you can throw a stone and not come in contact with someone who knows someone or has problems with substance abuse. 4 I was always a closet lover of acting. My mom was very practical. She never, ever restricted our dreams, always told us we could do or be anything. Then I said, 'Maybe I want to be an actor'. And she said, 'Maybe not that'. 5 [on 'Smashed'] To say we did it on a shoestring budget would be putting it mildly. We did it on a dental-floss budget. 6 I was not a Girl Scout, but I try to be very prepared. I triple-Spanx! 1 Was the 139th actress to receive an Academy Award for one of the two actress categories, either Best Actress or Best Supporting Actress; she won the Best Supporting Actress Award for The Help (2011) at The 84th Annual Academy Awards (2012) on February 26, 2012. 2 Graduated from Auburn University. 3 Between 1996 and 2013, Spencer has played a nurse at least 16 different times, including in movies such as A Time to Kill (1996) and Seven Pounds (2008), as a regular on the TV show City of Angels (2000) and in guest spots on shows like Chicago Hope (1994), "The X-Files" and Roswell (1999). 4 Is good friends with Melissa McCarthy. 5 Is one of 6 African-American actresses to win the Oscar in a competitive category. The others in chronological order are Hattie McDaniel for Gone with the Wind (1939), Whoopi Goldberg for Ghost (1990), Halle Berry for Monster's Ball (2001), Jennifer Hudson for Dreamgirls (2006) and Mo'Nique for Precious (2009). 6 Is one of 11 actresses to win the Critic's Choice Award, Golden Globe, Screen Actors Guild, BAFTA, and Oscar in the same year, winning for The Help (2011). The others to achieve this are Julia Roberts for Erin Brockovich (2000), Renée Zellweger for Cold Mountain (2003), Reese Witherspoon for Walk the Line (2005), Helen Mirren for The Queen (2006), Jennifer Hudson for Dreamgirls (2006), Kate Winslet for The Reader (2008), Mo'Nique for Precious (2009), Natalie Portman for Black Swan (2010), Anne Hathaway for Les Misérables (2012), Cate Blanchett for Blue Jasmine (2013), Patricia Arquette for Boyhood (2014) and 'Julianne Moore' for Still Alice (2014). 7 In April 2009, she was named one of the '25 Funniest Actresses in Hollywood' by Entertainment Weekly.